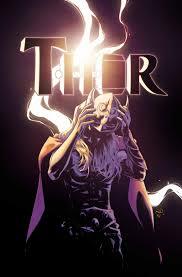 The new Thor has been accepted by most of the people in the Thunder God’s life. Unfortunately, one of the ones who hasn’t accepted her is Odin. Odin has sent the Destroyer, animated by Cul, Odin’s crazed brother, to kill Thor and retrieve Mjolnir. In response, Thor Odinson and Freya have gathered an army of female warriors, mostly people Thor suspected of being his replacement (Spider Woman, Captain Marvel, Scarlet Witch among them), to come and help the Goddess of Thunder. It’s a huge fight, and the array of power is staggering. Eventually, Freya’s arguments (and contempt) penetrate Odin’s thick head, and he orders Cul to withdraw. The Odinson had been devoting a lot of effort to figuring out who is currently wielding Mjolnir. He’s struck several names from his list, and arrived at a very understandable conclusion, one that many readers share. He gets to find out if he’s right or not in this issue, as the new Thor’s identity is finally revealed, just before everything gets changed by the Secret Wars shake up. Plot: I thought this was a good break point for the series. The power massed against the Destroyer is awesome, as in inspiring awe. And there might be hope for Odin, who has possibly realized what a major jerk he’s been. I’ll give the plot here a 3.5 out of 5. Art: As I’ve said before, Dauterman does a great job with this book. He draws the combat and the phenomenal power levels really well. It’s tough having so many characters in this one issue, and he handles it very well. I’ll go 4 out of 5 for the art. Positives: Freya’s army is really impressive. The fight is done really well, and I love how Aaron plays with the readers’ expectations about who Thor actually is. Negatives: Cul is just slimy evil for reasons I still don’t get, and I don’t see why Odin’s listening to him at all. I also don’t understand some of the decisions made by a few characters, especially by Thor’s alter ego. This has been a consistently great book, both in this volume and the one before it. Jason Aaron is really impressing me. I can’t wait to see what happens after the Secret Wars events. I’m hoping they don’t change the book too much. so is Secret Wars going to invalidate these 8 issues?